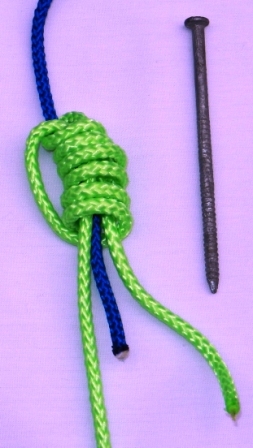 The nail knot is a great knot to tie when joining two lines of different diameters such as when tying a leader to a fly line. 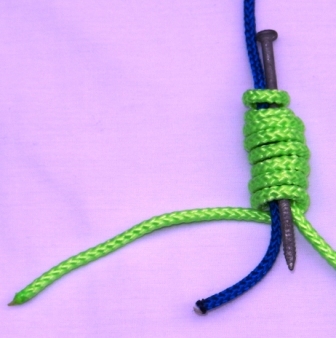 Getting its name from the use of a long smooth nail as an aid in tying, there are other things you can use to help you tie this knot successfully. Some anglers use a very small straw similar to a stirring straw for coffee. I have purchased a specific tool that has a forceps end, a line cutter, a needle to open up the eyes of hooks, and also grooves in the forceps end to assist in passing the line under and through the loops formed when making knots such as the nail knot. Lay your fishing line out as in the picture on the left. Let's assume the blue line is your standing line, the larger line or the fly line. Let the green line be your leader. The fly line should not be longer than the end of the nail. Be sure to allow extra line on your working end which is your leader. Begin by wrapping the leader under the nail and fly line and up and over the top. After completing your 8th loop around both the standing end and the nail, the third step is to take your working end and loop it upward towards where you began looping and pass the end through all the loops next to the nail. Now tighten the knot by pulling on the working end - be careful to not pull the knot off the blue line. Pull the working end while holding the coils - again do not let the blue end or fly line come out of the knot. Carefully remove the nail. 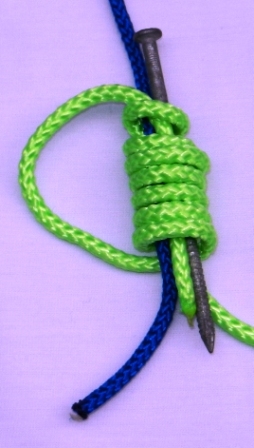 The final step is to tighten the leader knot against the fly line (green line against the blue line). Once the green knot is tight it will hold against the blue line. Test it. Notice what a tight spiral you have made, this will pass through the eyes of your fly rod and cast smoothly through the air. Nice work. Find a coffee straw and practice tying this knot using the straw in place of the nail. We are an Amazon Affiliate. If you purchase a recommended product we stand to earn a small commission from qualifying purchases. If you click on one of our recommended products and purchase a different product from Amazon we may also receive a small commission. These products do not cost you any more than what is posted. Our staff recommends items that we have personally owned, tested, researched or we have fished with trusted anglers who recommend them. The working end is the end of the rope or fishing string that you are actually working with. You are usually not working with both ends of the fishing line. When tying your shoes you are in reality working with both ends of your shoe string so both ends would be considered working ends. With fishing line you normally have one end you are working with and the other end is usually fastened to the arbor, hook or lure. The standing end is the end of the line tied to the arbor. 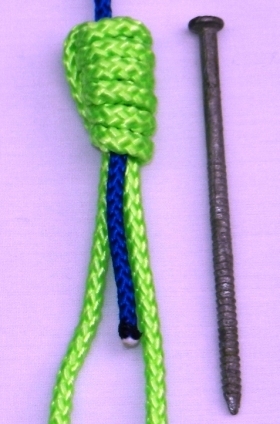 The standing part is the part of the line from the standing end to the knot. Remember these definitions when reviewing how to tie 10 favorite knots. When beginning to learn to tie fishing knots, you will need to learn to leave enough extra line on your working end to finish the knot. With practice you will learn to estimate this very closely. As you progress through tying the knot you will quickly learn to tell if you will run out of line on your working end. Sometimes you will need to just start over because you will not have started with enough extra line on the working end to finish the knot. The rope used in these pictures is of course much bigger than fishing line - as a result the knots appear much bigger. When done tying any knot trim any excess line on the working end so that it will not be in the way.